CYPECAD - program that carries out the analysis and design of reinforced concrete and steel structures, subject to horizontal and vertical loads, for homes, buildings and civil work projects. Its use guarantees maximum analysis reliability and optimum drawing design. The geometry of the structure can be introduced automatically. The user can personalise the design and edit the elements that have been introduced, with the on-screen support provided: numerous help options and error and warning texts. Provides very complete and precise construction drawings of the structure. CYPECAD is adapted to the latest national and international construction codes. 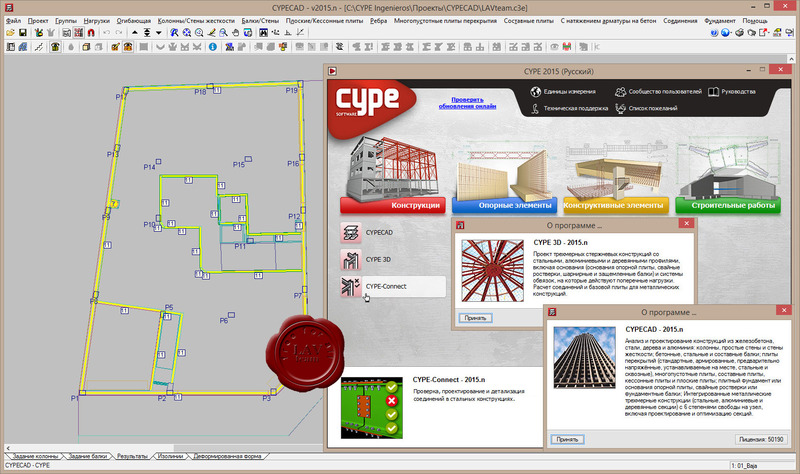 CYPE 3D - it is an agile and efficient program brought about to carry out the design of three dimensional structures composed of steel and timber bars, and their foundations, which includes pad footings, pile caps and strap and tie beams. Additionally, these can be redesigned and so obtain their maximum optimisation. It has been adapted to national and international steel, timber, aluminium and concrete construction codes. The program carries out the analysis, design and check of the fire resistance of timber sections. Performs a seismic analysis of the structure (Modal Spectral Analysis) according to national and international codes. Second order effects (P-delta) are considered with wind and seismic loads. CYPE-Connect - the program can check slabs with or without transverse punching shear reinforcement, takes into account the presence of openings or lightweight zones in the slab, and the position of the supports (internal, edge or corner). Punching shear verification is a program that checks the Failure Limit State of concrete for punching shear in flat and waffle slabs exposed to concentrated loads from rectangular or circular supports.